Dismissing the state’s appeal praying for conviction under Section 302 IPC, the Supreme Court has acquitted a person convicted by the high court for abetting suicide of his wife and daughter. The Supreme Court, while ordering a tenant to vacate premises immediately, said it was “unfortunate” that the landlord had been litigating for more than four decades to get back possession of his own premises. Can SC rely on PAC reports? Can SC refer and rely upon parliamentary standing committee reports? SC refers the question to constitution bench. The Supreme Court, in Palure Bhaskar Rao vs P Ramaseshaiah, has held that a senior will have to give way to eligible juniors if s/he is not otherwise eligible for consideration as per the rules for promotion. The Supreme Court on Tuesday held that high courts should not pass interim orders in the matters of college admission, more so, when the institution had not been accorded approval. The Supreme Court on Tuesday declined the request of amicus curiae senior advocate Shekhar Naphade’s request to reconsider the judgment in Satya Pal Singh vs State of Madhya Pradesh, wherein the Supreme Court held that the ‘victim’ cannot file an appeal against acquittal, without leave. The Supreme Court on Wednesday observed that the concept of criminal justice is not necessarily synonymous with social justice and lesser punishment cannot be awarded solely because the accused is a woman. The Supreme Court, in Surain Singh Vs State of Punjab, has explained the differences between two exceptions of murder under Section 302 of Indian Penal Code. The Supreme Court has set aside an order of the Appellate Tribunal for Electricity (APTEL) that had awarded compensatory tariff to Tata Power and Adani Power. 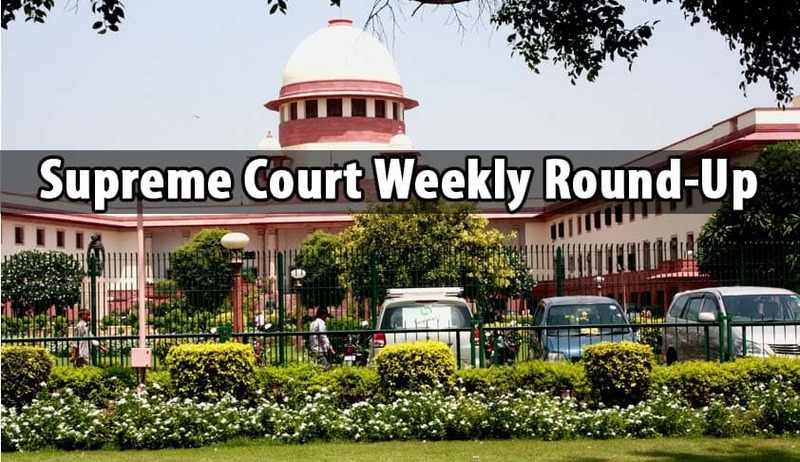 The Supreme Court, in Bhagwati @ Reenavs Anil Choubey, has observed that a husband, who was major at the time of marriage, cannot seek annulment of marriage with his wife on the ground that she was minor at the time of marriage. The Supreme Court has refused to allow a woman to abort her 27-week foetus diagnosed with polyhydramnios with Arnold Chairi malformation Type-2 severe hydrocephalus with lumbosacral meningomyelocele and spina bifida with tethered cord.